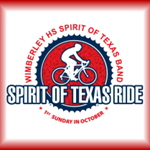 Come to Wimberley for the 2017 Spirit of Texas Ride! Join us on Sunday, October 1st, 2017, for a memorable 15, 35, 50 or 65 mile spin on some of the finest cycling roads anywhere. Based in scenic Wimberley, Texas, and just a short drive from Austin and San Antonio, this ride has earned a reputation for fun, outstanding scenery, excellent organization and friendly staff! This event raises much-needed funds for the Wimberley High School band program, which has experienced crippling budget cuts at the State level. Your participation helps keep the music alive for the next generation.